I have a minor suggestion. I am not completely sure this has been posted before, but I couldn't find a topic about it. I'm a big fan of the build mode and therefore I am turning all my VIDEO_TS dvd's into iso's. When I am batch building, I use a .bat script of course and I want it to automate. Unfortunately imgburn will popup the box where it says 11 files, 2 folders with the OK/CANCEL button. 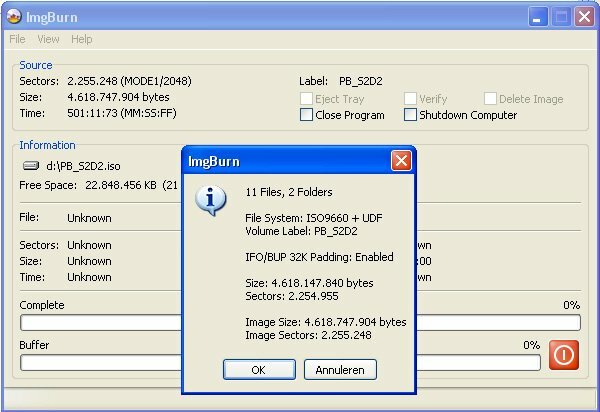 progra~1\imgburn\imgburn.exe /MODE ISOBUILD /BUILDMODE IMAGEFILE /CLOSESUCCESS /START /RECURSESUBDIRECTORIES YES /FILESYSTEM "ISO9660 + UDF" /SRC "m:\torrent\PB_S1D1" /DEST "c:\PB_S1D1.iso" /VOLUMELABEL "PB_S1D1"
For completeness sake I'll attach a screenshot. A thank you very much!!! I overlook that option... my mistake!